FAR Eastern University survived the best University of Santo Tomas can offer in a Game Three thriller, pulling off a 67-62 victory on Wednesday to end a decade-long title drought in the UAAP men's basketball tournament. Mac Belo scored 23 points while Roger Pogoy led a courageous, last-ditch push for the Tamaraws, who blew a 10-point lead after a long scoring drought bridging the third and fourth quarters battled back from a six-point endgame deficit before a crowd of over 23,000 fans at the Mall of Asia Arena. By taking the best-of-three series 2-1, the Tamaraws won a league-record 20th championship while ending a drought that started after Arwind Santos and Co. won the last of consecutive titles in 2005. This deep, talent-laden batch of Tamaraws also gave Nash Racela his first major championship as a head coach while atoning for a heartbreaking loss to National University in last year's finals. None of that would've been possible without Belo, who, after ending Ateneo's hopes in the Final Four with a follow-up at the buzzer, presided over a Tamaraws rampage that denied UST its first league title since 2006. Belo was later named Finals MVP. The former national player capped his game-long brilliance with the free throw that hiked FEU's lead to 65-62 with 18.2 seconds to go before scooting back on defense to block a layup by UST guard Ed Daquioag. 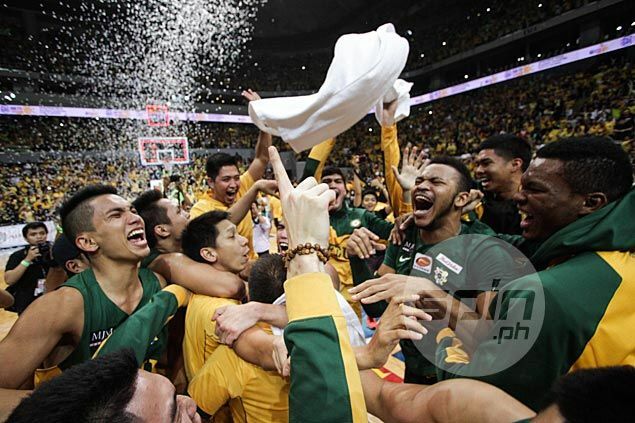 That set up Russell Escoto for the two title-clinching free throws, triggering wild celebration on FEU's side of the arena where confetti and multi-colored balloons fell from the catwalk. However, the Tamaraws wouldn't have been in a position to steal the win if not for Pogoy, a deadly Cebuano who led FEU back from a 51-57 deficit by hitting a coast-to-coast drive and a clutch three-pointer, 61-60, with 1:27 minutes to go. Pogoy added 14 points for the Tamaraws while Mike Tolomia made up for his 0-of-15 shooting performance in the Game Two loss by scoring 13 points and dishing off three assists. In all, FEU outscored UST in the final 3:25, 14-3. The Tigers never recovered after that as top gun Kevin Ferrer, who scored 24 points in one quarter in the team's Game Two win, turned gun-shy with just six points on seven attempts. With Ferrer turning silent, senior guard Ed Daquioag and rookie Marvin Lee took it upon themselves to take charge for UST, combining in a 16-0 run bridging the third and fourth quarters that put the Tigers on top, 57-51, with 5:03 minutes remaining. FEU 67 - Belo 23, Pogoy 14, Tolomia 13, Tamsi 6, Ru. Escoto 5, Inigo 3, Jose 2, Orizu 1, Dennison 0, Arong 0, Ri. Escoto 0, Trinidad 0. UST 62 - Daquioag 21, Abdul 12, Lee 9, Ferrer 6, Vigil 6, Lao 6, Bonleon 2, Sheriff 0, Faundo 0, Huang 0. Quarterscores: 18-19; 30-30; 51-46; 67-62.